Developer Aquaplus is at it once again by mixing two unlikely gameplay genres into one mysterious form. 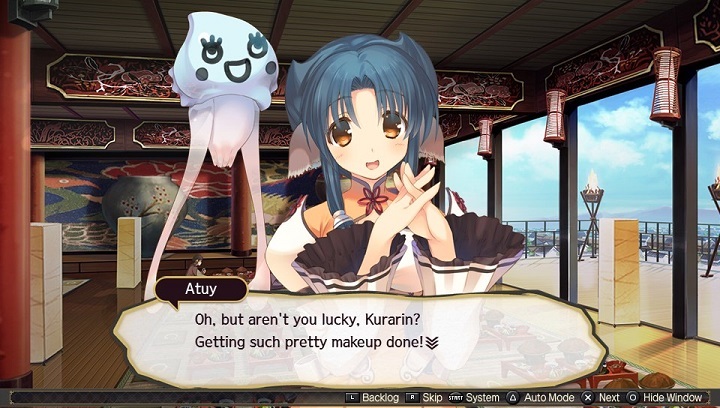 Their newest culmination of this concept is that of part visual novel and part turn-based strategy-RPG game titled Utawarerumono: Mask of Deception on PS4/Vita. Despite technically being a sequel to a fairly old Japan-only PC game back in 2002 plainly named "Utawarerumono", Utawarerumono: Mask of Deception still somehow strongly feels like first entry in spite of it. Character relationships and backstories have been rebuilt from scratch, so whatever memory I thought I had of the original series (after seeing the 2006 anime adaption) feels like a deception despite wearing a mask of familiar themes and names. Which is perfectly fine by me, and likely a would-be broader audience as well. Utawarerumono: Mask of Deception is more than willing to replace whatever gaps in knowledge one may have about its original source material by slowly filling it in with a whole new legend. Admittedly I had a general gist of what I signed up for after having played the overlooked PS3 gem, Tears to Tiara II: Heir of the Overlord, a few years ago by the same developer. Yet, even I still underestimated just how Utawarerumono: Mask of Deception is far more of a visual novel than it is a tactical-RPG. What is more bizarre is that SRPG portions aren't even half bad, actually. But whatever strategic gameplay it has can feel like a huge afterthought when it is buried in what is occasionally around four hours of uninterrupted visual novel exposition. As a visual novel first and foremost Utawarerumono: Mask of Deception is incredibly meticulously paced with its storytelling. It uses the time-worn amnesiac trope with its lead protagonist who starts off without any memories of his past in the middle of a random snowfield. 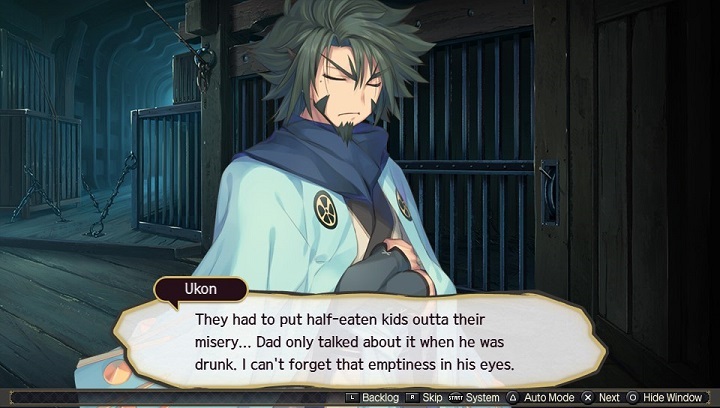 Saved from a near-death experience by an animal-eared (and tailed) lady apothecary named Kuon, she decides to adopt the amnesiac lead on a whim as a sort of parental figure and bestow upon him the name "Haku". From then on it gets into a disjointed rhythm of having Haku slowly but surely learn more about the world around him as he accompanies the mysterious apothecary, and his newfound guardian, on her journey throughout the region. When it comes to storytelling Utawaremono: Mask of Deception does a lot really well, and in nearly equal parts extremely poorly too. It all pretty much has to do with the narrative's pacing. By far the worst of it is in its first half. The storytelling is intriguing enough starting out, but is a rather noticeable slow burn. Kuon keeps the habitually lazy Haku in check by subtly imposing upon him the mentality of "He who doesn't work doesn't eat", and there is strong world-building that is thoroughly steeped in an own sense of internal culture all the while (despite some clear feudal Japan influence). As soon as the storytelling moves to the royal city of Mikato the narrative's pace quickly grinds to a halt, however. Serving as a sort of quick and unfortunate tone setter, player's are almost immediately greeted to a random anime "fanservice" hot springs scene right when they arrive in Mikado. And... it's kind of like that for the next ten hours. There is a lot of intended levity from then on out. Sure, it has plenty of world-building and character introductions during this time too. More often than not, it feels like a shameless excuse to throw in perverted wardrobe malfunction moments, Fujoshi gags, and rampant drunken shenanigans for quite some time. It is very frustrating to see such a promising world and cast be bogged down by back to back slice-of-life styled anime pandering. Surprisingly, the written localization and fully-dubbed Japanese voice work are actually quite good and often reads well in spite of this, so several jokes and quips hit their mark despite me not being enchanted by the general context. By and large, though, it feels as if the first half is really dragged out by wholly unnecessary fluff when faced with its larger and far more engaging overarching storytelling. No better proof of concept than that of when second half of the narrative kicks in and is far better. Seriously, it's really good. The pervading narrative tone becomes darker and more mature. This is no small thanks due to a bigger emphasis on wartime conflict and political intrigue styled storytelling. It is a real stark contrast to what was hours upon hours of regurgitated alcoholism jokes and skeezy fanservice scenes not too long before. For as much as I may complain about the first half, Utawarerumono does also thrive on interpersonal storytelling as well and that's prevalent throughout. 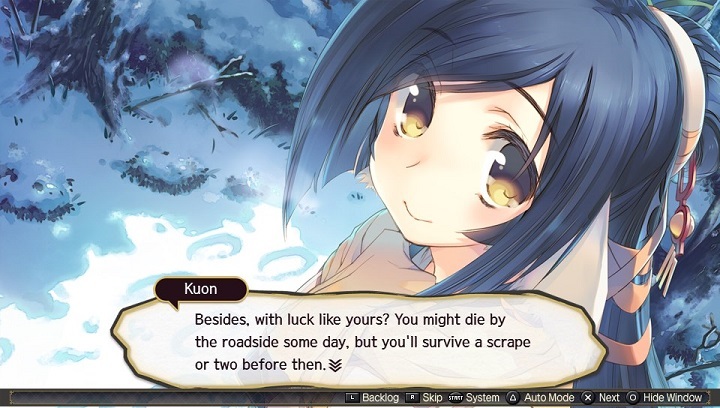 Kuon in particular is a very fascinating character and is a clear standout amongst a majority of the cast. While most others, being generally (or eventually) likable, they more or less adhere to a set of familiar character traits throughout, almost regardless of whatever tone the main narrative decides to take the form of. Also around the second half the title is more willing to remind the player (all be it, still infrequently) that it is an strategy-RPG too. 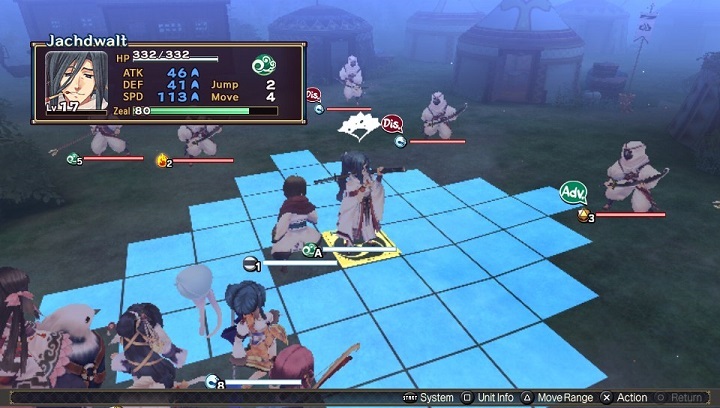 Co-developer Sting is certainly no stranger to solid tactical RPGs and the gameplay of Utawarerumono: Mask of Deception is no exception. Compared to Sting's usually enigmatic take on the subgenre combat is mostly standard fare for turn-based strategy-RPGs standards. Most mission objectives are not anything more complex than defeating one or more enemies on small maps. That said, it is usually good about making each player character have their own pretty unique skillsets and applications in battles. Haku for instance is fairly weak in traditional combat (just like in the main narrative), and is more about passively supporting nearby allies and debuffing enemies. On the other end, the close-ranged fighter Atuy can forcibly stop enemies from moving with her mere presence and potentially get a bonus action upon defeating a foe. The gameplay also applies a few more distinct spins with the general flow to help make it more feel more active. Most attack or support actions can be followed with chains skills where depending on if the player presses, or holds, the X button at the right time they can eek out just a bit more potency or special properties out of their skills. This applies to defensive skills as well and it's real satisfying to prevent what would've been fatal damage by timing a good block or dodge. If one finds that to be too much work regardless players can simply toggle 'auto-chain' at any time, even if they miss out on the chance to pull off criticals. Speaking of such conveniences, the game also has a few nice interface touches like being able to rewind turns, see predicted damage/counter outcomes, or participate in free battles. Going briefly back to storytelling, there is more that bears mentioning during the second act. Most importantly of note is that the finale does in-fact end on a cliffhanger -- and a mean one at that. It is certainly exciting leading up that point but it is more than abundantly clear it serves as groundwork for its sequel Utawarerumono: Mask of Truth that comes out later this September. With a standard playthrough of Utawarerumono: Mask of Deception taking a bit under forty hours can make it seem all the more cruel. But I suppose during that wait players can occupy themselves with several optional, and challenging, post-main story battles that give the underutilized combat more time to stretch its legs. For as many criticisms I can easily level against it, specifically the terribly paced first half, I feel much more positive than not about Utawarerumono: Mask of Deception as a whole. I think much of that can be attributed to a sort of indecipherable sincerity that is buried underneath the intricate world-building and likable characters that it all takes place around. Plus, while very underutilized, strategy-RPG portions are enjoyable too. Regardless, it demands an unreasonable amount of patience out of most players to overlook such glaring shortcomings as a visual novel. Which, frankly, I doubt most are willing to spare. 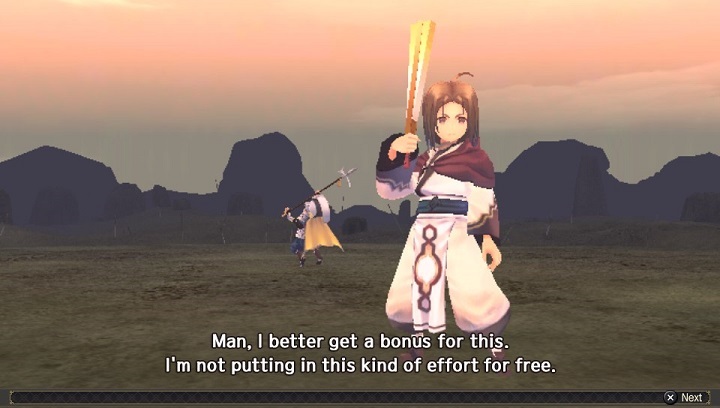 It is also difficult tell if even such persistence will be rewarded during the upcoming sequel Utawarerumono: Mask of Truth that is being released September of this year. Despite Utawarerumono: Mask of Deception running the gamut of emotions and testing my patience more than a few times, however, I think it says a lot that I am still quite eagerly looking forward to playing its sequel despite all odds of the experience being stacked against it.